In our 430 square foot studio apartment, there is no actual bedroom. There’s a nook just large enough to squeeze in up to a queen sized bed, though. And that’s all we needed to put in a cozy and perfectly functional little sleeping area with tons of storage. 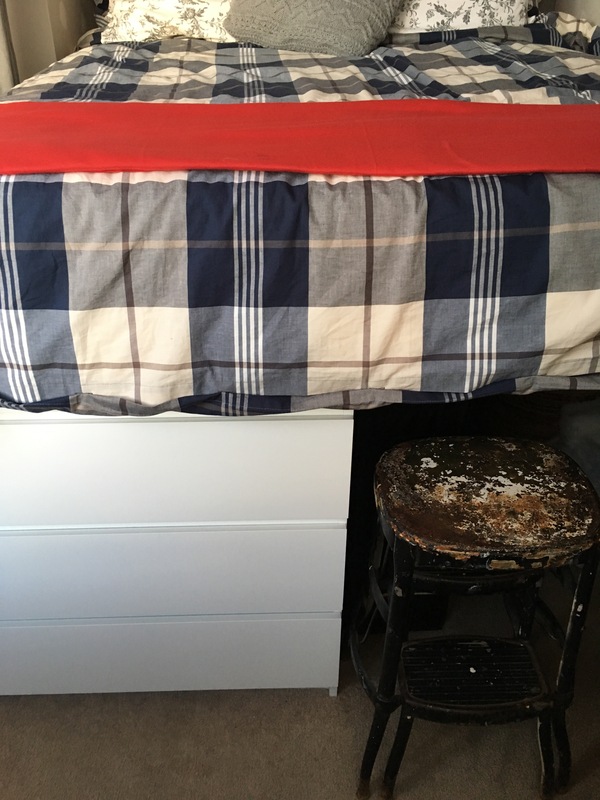 Here’s what we did: we built a platform on top of a couple of dressers and some four by four posts. threw a double (full) sized mattress on top, added some decorative touches and that’s all the bedroom we need! We got a cable curtain rod from Ikea (http://www.ikea.com/ca/en/catalog/products/60075295/) to close the area off for privacy. The two dressers form one corner of the bed with the drawers facing out for easy access. Underneath the platform (behind the dressers), there is a crawlspace-like storage area that fits a whole lot of stuff. We keep out-of-season clothing under there, tools, an earthquake survival kit/backpack and water jug, our laundry hamper, and some other odds and ends. The crawlspace is also our earthquake survival plan – if/when Vancouver starts a-shaking, we’ll take cover under there. In the opposite corner (not pictured) we put a tall, skinny Ikea Pax wardrobe (much like the one pictured here: http://www.ikea.com/ca/en/catalog/products/S59127511/ …except without drawers on the bottom half). It fits perfectly with one side against the tiny bit of wall before the window starts, and it takes up very little floor space but you can fit a lot of stuff in it. We’ve used the top half to hang clothes and the bottom half for guitars. My husband is a guitar player, and anyone who lives with one of these will know that one guitar is never enough, even for a minimalist, and there is no such thing as too many. This is a conundrum in a tiny space. While I find musical instruments are often so beautiful they can be hung on the wall as art, you don’t necessarily want ALL the instruments hanging on the wall. So this wardrobe has been a perfect solution for us. We’ve hung his most beautiful guitar on the outside of the wardrobe (on the side facing the bed) so that it’s on display, his acoustic lives on a stand near his comfy chair so he can just reach out and grab it when he feels inclined to strum, and the rest are tucked away out of sight along with his pedals, a small amp, cords, plugs, headphones and all the other messy knick-knacks necessary for a long-legged guitar-pickin’ man to be happy. The vintage bedside wall lamp is one of my favourite things! It was a lucky find from Picks By Bear – Fedora Antiques & Collectibles Customer Group. A lamp with a bendy arm that attaches to the wall is the ideal thing for a tiny sleeping area where there’s no room for bedside tables. 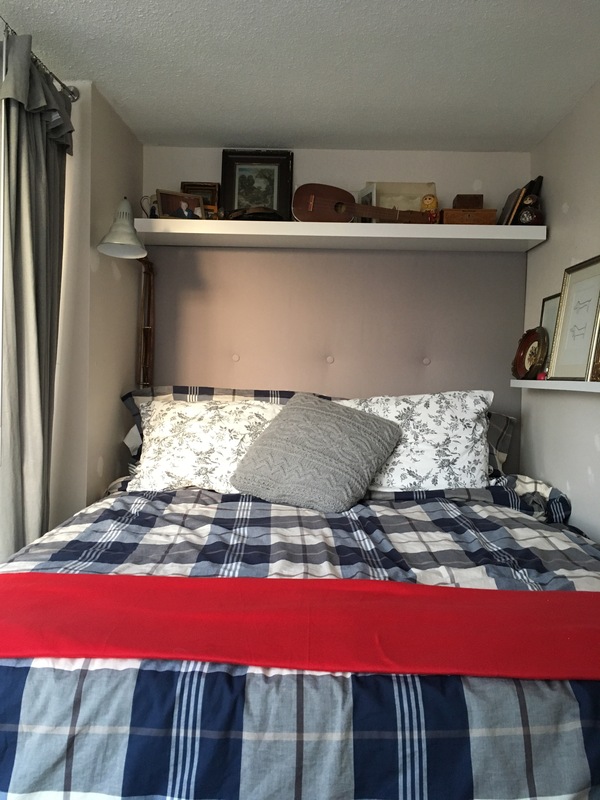 The headboard was an easy DIY project done by yours truly. I wanted something light weight so that installation wouldn’t involve a lot of screws (one has to think of wall damage when renting one’s home). So I bought a piece of Coroplast (http://www.coroplast.com/) from Home Depot, covered it in quilt batting and wrapped it with a light grey fabric. I completed the look with large fabric covered buttons. The finished headboard is practically weightless, so we were able to affix it firmly to the wall with nothing more than finishing nails. Above it is a Lack shelf from Ikea (we like Ikea, can you tell?). It’s the longest one they make (the next size down was too short), so it had to be cut to size to fit into the nook. This was a tricky proposition, as the walls in our early 1970s apartment are not exactly square. The visible gaps were unavoidable, unfortunately. But what can you do? If we owned the place, we’d make more of an effort to custom-fit things like this. On the side is a picture rail from, you guessed it, Ikea. (Seriously though, no one does small spaces like the Swedes)! Picture rails like these are so great in a tiny space because there is not a lot of wall space to work with, and this way you can layer your stuff, just go ahead and cram that rail as full as you want. It’s fun! And it’s a great solution for small pictures – if you layer them amongst larger ones in a big grouping along the rail, it will look unified, like one big piece of art rather than a smattering of tiny bits. This beat up old step stool in the photo above is a back alley find from right behind our apartment building. It looked as though it had spent a few years as a plant stand on someone’s balcony before it ended up beside the dumpster, covered in paint spatter and caked-on mud. I took it home, gave it a thorough scrubbing, tightened up all the bolts, and here it is: a very awesome step ladder to our bed! I love it in all its glorious beat-upness. When we first rescued it from the alley, I thought I might spray paint it red or lemon yellow once it was cleaned up. But I couldn’t decide what to do, and actually really started liking it just as it is. Sometimes being indecisive is a good thing. When planning a tiny space, you often find yourself asking the question: how much space do we really need? I’ve watched a lot of episodes of House Hunters where people inevitably will walk into a cavernous bedroom, scrunch up their faces with judgment and say, “This bedroom is so small, I don’t think it will fit my furniture,” to which I will inevitably respond by yelling at the TV (with an equally judgy expression), “My whole apartment would fit in that room! How big is your furniture? ?” But people tend to cling to their stuff. Their furniture is too big for the place they’re looking at buying, but it never occurs to them to get rid of some of their stuff, and get smaller stuff to accommodate the space. When you make the decision to go tiny, you may have to change the way you think, the way you look at space. And the way you think about your stuff. You have to be willing to get rid of stuff. The bedroom nook in our tiny apartment is approximately five feet wide by ten feet long. Nothing we had before we moved to this apartment would have fit into this space. It took some thinking outside the box to come up with a way to make the most of such a limiting space. It took careful planning and some custom building. We ended up with a comfortable, inviting little sleeping nook with more storage space than we ever imagined a 50 square foot area could have. I’m very happy with the final result. I’d even go so far as to call it pretty! ← Let’s talk about s-e- …(wait for it)… ctionals! This looks so inviting! Nice work!